Commercial pet food has been the source of dismay for pet owners and more are becoming educated on the topic in recent years. Kibble and canned foods, once thought to be the only choice for feeding pets are now under scrutiny for unsavory practices which have been reported to include everything from 4-D ingredients to faulty ingredient lists, and harmful additives that cause everything from cancer to death in our beloved pets. At the very least, these foods even at their very best, do not offer the bio-availability that a home prepared diet can offer. I will be very honest here; I prepare all of my dog food myself from ingredients I buy and put together via a balanced diet I have created. While I firmly believe this approach to be the absolute best way to feed a dog; it's just not always possible for everyone and that's why I enjoy testing out commercially available raw foods in both freeze dried and frozen formats. Let's be realistic here: in the event of an emergency, my homemade food that needs to stay cold is going to be the loser in choice over something that is shelf stable. 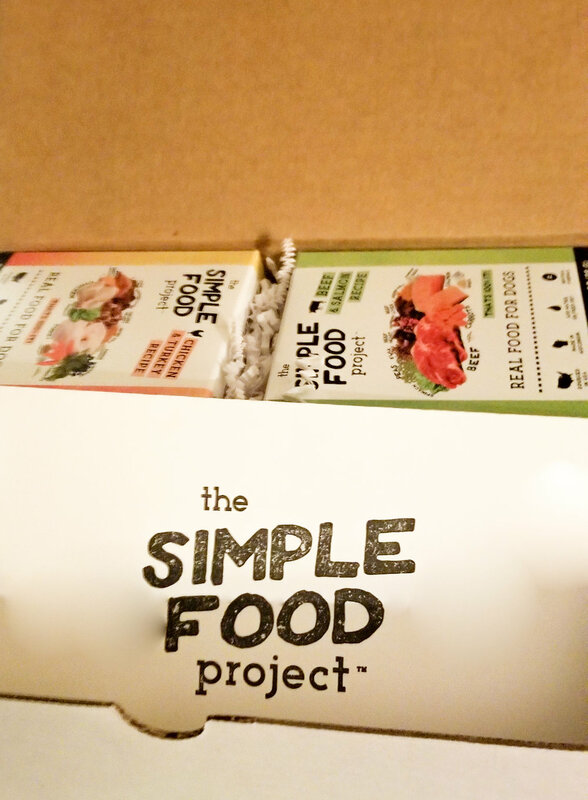 The Simple Food Project is a new option that is available for the pet owner who wants to feed an optimally healthy diet without the inconvenience of preparing raw food at home. Veterinarian created human grade whole food recipes are all sourced in the USA and made in their own facility in Wisconsin. True to the name, this brand is not only simple in the ingredients listings, but also simple to feed. Nugget formed meat, organ, and bone are freeze dried and served with ingredients like peas, lentils and apples which assist in the balance of the diet. What makes this food stand apart from the rest is that it uses no synthetic vitamins or minerals to balance the diet. This is HUGE and something I have rarely seen on the pet food market, because when we talk about the ability of the body to synthesize nutrition, the most appropriate format for that process is from fresh, whole foods with those nutrients coming from their original form. While peas aren't a favorite ingredient of mine (they can cause gassiness), they're only present in the beef and salmon formula. My only other complaint is that there is beef in 2 of the 3 formulas. Beef can be an allergen, but then again so can any other protein source. I assume it is present due to the amazing nutrient benefits beef liver can provide at a minimal cost. Realisticlly, this food is a perfect example overall of what you want to see, in which order, in your pet food. Lucy kept eating it so fast, I could barely take a picture! My dogs aren't very discerning, so they devoured every recipe choice just like they do anything else. They're dachshunds and aren't known for being picky! However in my experience as a dog walker and pet sitter, these types of foods are well received even by the pickiest eaters because of the very high level of smelly goodness - meat and organs, which they were built to thrive from. Overall, we really loved this new freeze dried raw dog food and do recommend it!